Angela Fubler, founder and director of the all-boys school, credits an early conversation she had with Mark Guishard, BIOS director of corporate and community relations, with laying the groundwork for this new collaboration. “The timing was perfect and the connection between BIOS staff and our team at Chatmore was instant,” says Fubler of the meeting. Along with Andrea Cann, Chatmore’s assistant director, Fubler shared her vision with BIOS education staff of celebrating local expertise, engaging the community as an educational resources and aligning learning experiences with students’ natural interests and talent. As a result, beginning in mid-November, BIOS educators and scientists will provide formative and relevant experiential learning opportunities for Chatmore’s S1 students. The sessions, which run until May 2017, will focus on topics in science, technology, engineering, art and mathematics (STEAM) with the ocean as a central organizing theme. BIOS’s STEAMAhead curriculum, rooted in the principles of Ocean Literacy and aligned with the British National Science Curriculum, will introduce students and educators at Chatmore to cutting-edge technology and scientific research, while also fostering the development of real-world skills such as creativity and problem-solving. “Our goal is to utilize the resources at BIOS to support Chatmore’s vision of cultivating a nation of learners who are global thinkers, investigators, explorers, innovators and inventors,” explains BIOS science educator Kaitlin Baird. This also supports Ocean Academy’s ongoing efforts to use ocean science education to translate the work of BIOS scientists into meaningful experiences for students, teachers and residents. For Fubler, this is an opportunity to see her school’s mission to “teach the way students learn” come to life. 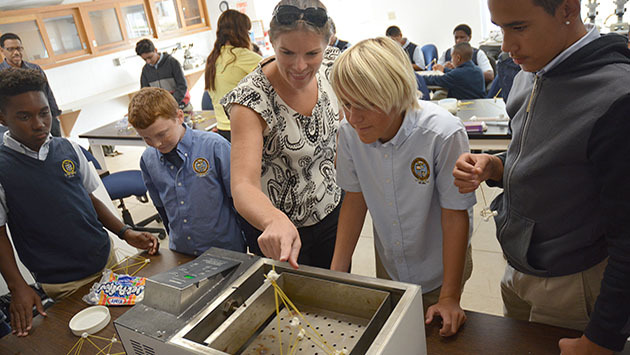 The BIOS Ocean Academy program gives Bermudian students of all ages the chance to experience ocean science first-hand with a variety of learning opportunities in the classroom, laboratory and field. For more information on Ocean Academy please visit www.bios.edu/education. For more information about Chatmore please contact 232-4542 or visit www.familyfirstschools.com.